Taken, as a lot of my photos are, locally. This is on Seaford Beach, just down from Seaford Head, a collection of small fishing boats that reside on the pebbles until time to go out and catch fish. 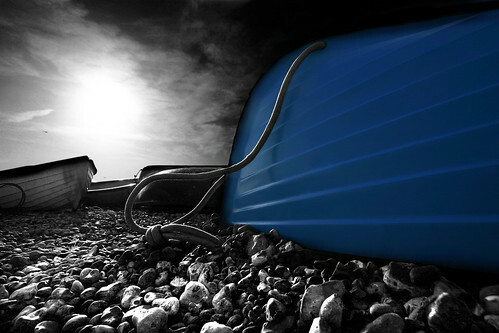 These are always the focus of many photographs, they are somewhat of a Seaford icon. This will be part of my new Photography Portfolio, a new website dedicated to my photos. Due to the popularity of these boats being used as the focus of photos, I wanted to try a more creative angle. I had in mind the desire to do some work in Photoshop for this shoot, so I took photos with this in mind. I wanted to try and make them look like they could of been taken pretty much anywhere, except possible to those of us that live in Seaford and can see the personality of these boats from a mile away. After all, I for one walk past these every day whilst walking my dog Dylan. The photos taken with my trusted Canon D300 and a 12mm wide angle, which has proven to be the most reliable camera I have ever had, not to mention it surviving 3 months circumnavigating Egypt, one whole week of which was in the Black and White desert. The Photoshop process was actually pretty involved as I spent a lot of time tweaking the brightness and contrast of individual pebbles and also creating a much more dramatic sky,. You will also noticed the sun hitting the hanging rope from the blue boat, this thin line of white was enhanced with the ‘dodge’ tool. Clearly I had to cut-out the boat in order to colourise it as I have. This was simple, but creating the right depth of blue to set against the grey took some trial and error. It involved a lot of retouching of the blue hull to create this soft almost plastic type look, and to scrub out any imperfections. I wanted it to look like it was just painted, which in fact it just had been, but was showing signs of wear and tear. This is one of my favourite retouched photographs, one that I feel really works and goes to make the picture a joy to look at.